Episode 46: Russian Cup Results and Gabby Dancing With The Stars? The Russain Cup. Graphic courtesy of My Crazy World of Graphics. This week the GymCastic Crew discuss results and performances from the Russian Cup, including the absence of Anastasia Grishina from the World Team; the scandal also known as dun dun dun dunnnnnn GrishinaGate. We debate the merits of the Russian system in which all the dirty laundry is aired in the press versus a system with more secrecy like the US; casting updates from the Gabby Douglas movie ( this kid!) 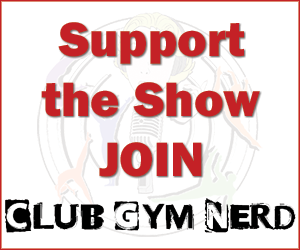 and her possible role on Dancing With The Stars (yes, she moved to LA last week); bestselling author Julie Cross’s new book Letters To Nowhere; Jenni Pinches nerd-fighter worthy mobile game, USAG’s 50th anniversary magazine-gasm; and finally we present dramatic Tumblr readings from the gymternet. Play Jenni Pinches game Laser Chambers here. Exhibit C: Just look at her hair! So, I’m slightly confused about something. How come people can mockingly attempt British accents and it is perfectly ok, while if that was done to almost any other accent, it would be considered offensive and never done? You wouldn’t have tried to give complements in a Chinese accent when talking about Cheng Fei, because that would be offensive–nobody would even suggest doing such a thing. How come it is ok to do that with a British accent? I felt mildly offended, so I wanted to bring it up. It’s a great accent regardless. But as far as it being okay – I think it’s a general society acceptance that making fun of a dominate culture, majority or someone in power is fine. For example, picking on a white american man is generally acceptable. It just is the way it is. We were sincerely trying to pay tribute to Beth with our accents. They were not intended to be mocking at all.